Do these 90° + days have you wondering how you can make it through July? Us, too. But there are some definite perks to the hot weather. The Boise River is open for floating, you have license to eat as much ice cream as you want/need to stay cool, and we are fully stocked with our favorite summer wines. And if that's not enough to keep you happy in the heat, our Super Summer Sale is just around the corner. This year, we're putting ALL our wine on sale for 15% off*. 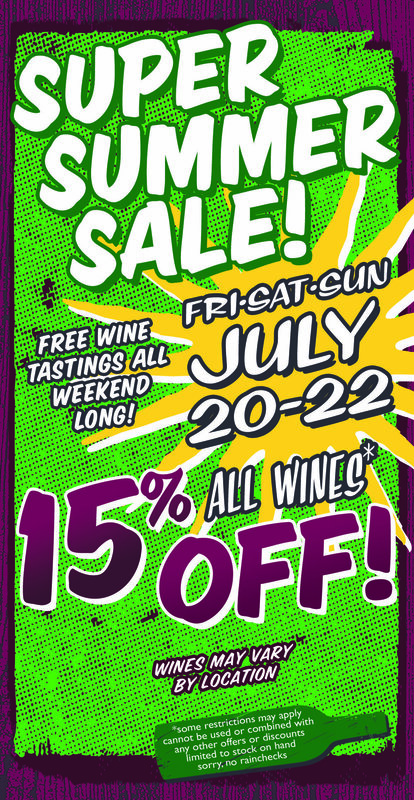 So stop in Friday-Sunday July 20-22nd, taste some free wine (see below). and stock up on your summer favorites. Free tastings throughout the weekend! Check out the schedules below. *Cannot be combined with any other discounts or offers. Limited to stock on hand. Some restrictions apply.